Radhika Apte On Rewriting The Rules, Graces The January Cover Of Harper's Bazaar India! Radhika Apte On Rewriting The Rules, Graces The January Cover Of Harper’s Bazaar India! 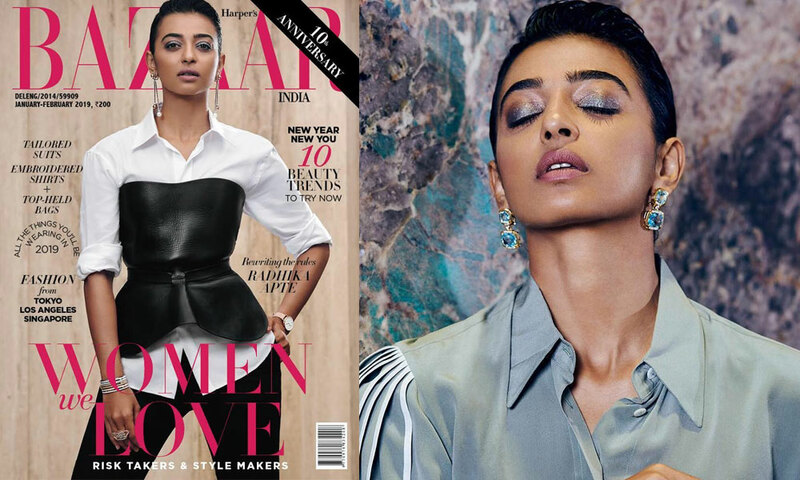 After having an eventful 2018, Radhika Apte gets into the monochrome groove, rewrites the rules of Bollywood and graces Harper’s Bazaar India cover this January! Radhika Apte is committed to her craft and is rewriting the rules of what it means to be a Bollywood star. The magazine has also released the inside pictures of Radhika Apte, where the AndhaDhun actress has nailed all the looks. In all the pictures Radhika seen sporting the Contemporary looks and standing tall in it. On Cover, Radhika sports monochrome separates of a shirt, pants, and corset from Dior. Earrings and ring from The Krishniah Chetty Group of Jewellers along with a wristwatch from the brand that she endorses, Daniel Wellington up the look. Shimmery eyelids, pink lips, and slick pulled back hair round out her look. 2018 established this fact with a worthy testimony of six releases in fewer than 12 months, 8 Magazine covers and 3 web series in a year, Radhika seen ruling every medium possible being omnipresent on each of them. Throughout the year 2018, Radhika Apte has carved a place for herself in not just the Indian film industry but also the digital streaming space. After being omnipresent on every medium possible which makes Radhika stand out among all other actors in 2018. With movies like Andhadhun and Padman doing extremely well at the box office, Radhika Apte believes she has had quite a run this year. The actress not only shined through her movies but also made her presence felt on the small screen in the form of web shows. Radhika had three releases — Lust Stories, Sacred Games and Ghoul — this year on streaming apps. Radhika’s both the movies Andhadhun and Padman is on the top rated Bollywood movies this year. Andhadhun also made it to the 2nd position on the all-time best movies 250 of Bollywood after Aanad. Recently, IMDb released it’s top 10 stars of Indian Cinema list for the year 2018 and Radhika owing to the great year she has had shines in the list. Radhika Apte was also honored with the title as the “Woman of the Year” by the multiple magazines and was awarded for as the same. The actress also graced the cover for Forbes India’s 2018 Celebrity 100 list. Previous articleA Goan Sojourn For Filmmaker Ritesh Sidhwani!